Founded in 1872, the Bell Museum of Natural History was established to showcase Minnesota’s diverse animal and plant life for others to learn about and enjoy. After nearly a century at the previous Minneapolis location, the Bell Museum of Natural History opened their doors in July, 2018 at their new state-of-the-art facility located in St. Paul, MN. Acucraft Fireplace Advisor Ben Krump received a call from MMC who was implementing the architect’s gas fireplace design for the Bell Museum. The design included a unique circular fire feature encased in 360-degrees of dual pane tempered glass. Museum patrons would enjoy views of the tallest, fullest and safest flames on the market from any vantage point, feel radiant warmth during cold winter months, and benefit from glass cooling technology for safe-to-touch glass. The timing of the custom gas fireplace project required some creative problem solving. Normally, the gas and electric connections run through the bottom and center for seamless uninterrupted flame views through the glass. Since the concrete floor had already been poured at the Bell Museum, the Acucraft Designers needed to modify the gas and electric connections through the top and center of the fireplace. Upon design approval, the highly skilled Acucraft Production Team began fabricating, welding, and finishing the Bell Museum custom gas fireplace using the highest quality materials and components to last a lifetime. 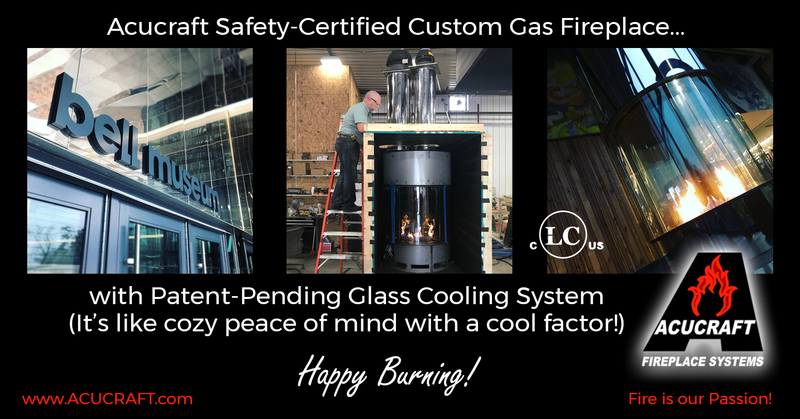 Before the Bell Museum custom circular gas fireplace was crated, shipped and delivered to the job site, it was Third-Party tested and certified within Acucraft’s internal test lab to meet or exceed ANSI Z21.50/CSA 2.22 performance and safety standards with Label. Acucraft is the only fireplace manufacturer in the world who is third-party certified by Lab-Test Certification, Inc. to conduct internal testing. That’s how much Acucraft cares about your peace of mind for a lifetime of happy burning. No other fireplace manufacturer has gone to this length to ensure your fireplace safety and performance. Acucraft custom circular gas fireplace warms patrons and burns brightly at the Bell Museum of Natural History. Upon delivery, the Acucraft Service Team walked the Fireplace Installers through the installation process. After installation, Acucraft is always able to accommodate your onsite service and support needs. Now installed, the Bell Museum custom gas fireplace is producing cozy, warm radiant heat for Minnesota winter months, while at the same time, the Acucraft patent-pending dual pane Glass Cooling System is providing safe-to-touch glass for museum patrons. Acucraft Circular Gas Fireplaces are unique and we offer a range from 24’D to 96’D. Acucraft is currently performance and safety testing a circular gas fireplace that is 108″ tall. The circular design evokes curiosity. The flames stir intensity and passion. The combination is ideal for commercial spaces and luxurious homes. 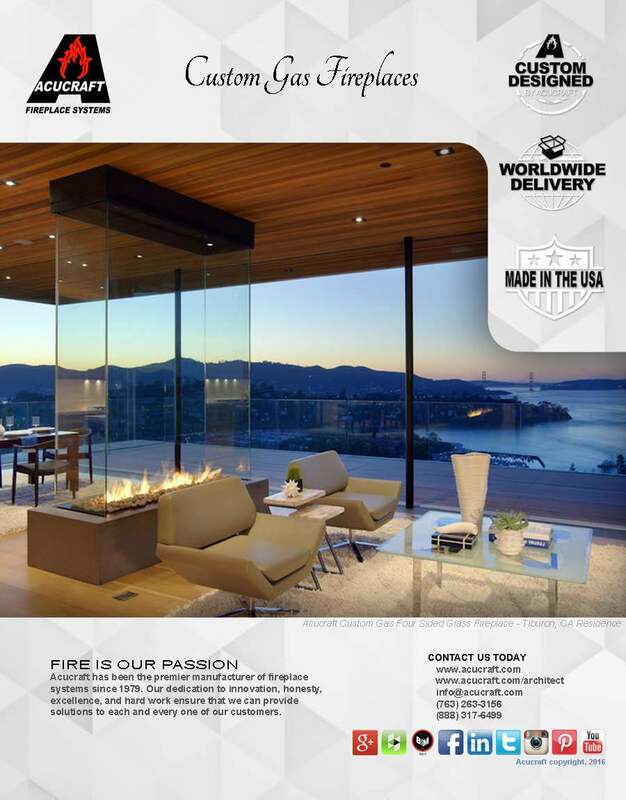 Request Your Acucraft Custom Gas Brochure Today! For over 39 years Acucraft has been designing and manufacturing one-of-a-kind wood burning fireplaces and gas fireplace systems. We deliver innovative solutions, revolutionary designs, use the highest quality materials and components, rigorously test units for safety and performance, and meet lightning-fast response times. Every unique fireplaces is backed by the Acucraft Lifetime Guarantee. Now that’s peace of mind for a lifetime of happy burning. Call Acucraft toll free at (888) 317-6499 or email info@acucraft.com.